This large re-roofing project was recently completed in March 2014. The extensive renovation of Trelawney House, which was originally the old vicarage on Church Green Witney now part of Henrybox School Academy, took place under a fully covered scaffolding during the winter of 2013. The entire existing bitumen flat roof was removed, re-decked and relayed in new lead. The four chimneys were re-rendered in a new lime mortar restoring the building to its original finish. All surrounding stone slate roofs were completely stripped back to the rafters, insulation was then added to comply with modern building regulations. The roof was then treated with preservative for the prevention of woodworm before being re-laid on a new breathable membrane and treated baton. Cotswold stone slates covering an area of over 400sq m. were then re-laid. The roof has eleven dormer windows which were replaced in the existing style ensuring the building lasts for another few hundred years. "The Henry Box School in Witney used the services of Pethers of Burford Limited during 2013/14 with regard to the renovation of the roof of Trelawney House, a Grade 2 listed building that was previously the Rectory for St Mary’s Church. The project was for a sum in the region of £300,000 and took approximately 6 months to complete. During the whole process Piers and James Pether undertook the work in sympathy with the comings and goings of the school. We met regularly, progress was made as planned, some limited changes in scope were accommodated and they worked throughout in a clean and tidy environment. 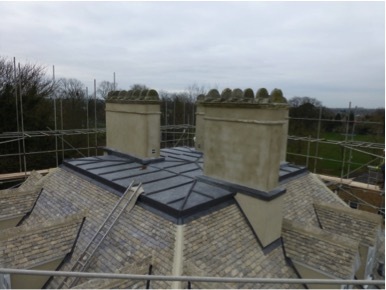 The project was completed in accordance with the deadline specified in our funding terms and conditions and the roof has been fully refurbished, using original slates recovered from the roof as far as possible, to the complete satisfaction of the WODC Conservation Officer and our Property Consultants. As a result of our overall satisfaction we have continued to use them for other work on the school site and I would have no hesitation in recommending them to you. Yours sincerely, I P Bishop Business Manager "
Copyright © Pethers of Burford Limited. All rights reserved.